By Andrew Hore in News and Views, Uncategorized on 8th January 2018 . Kryptonite 1 (KR1) has invested $249,000 in a presale of 4,775,686 Simple tokens in a project administered by OpenST Ltd. The plan is for the tokens to be used to enable digital currencies to be launched by businesses. There has also been a $100,000 investment in the presale of tokens in the Props project. That bought 859,569 Props tokens. These tokens are used as a cryptocurrency as part of a decentralised ecosystem of video applications. DagangHalal (DGHL) has launched its mobile app MEEMBAR (meaning raised platform in Arabic), which is targeted at Muslim travellers, on the Android platform. The app provides details of mosques, hotels and restaurants in an area. The app will become available on the IoS platform later this year. Longer-term, the company wants to introduce the ability to undertake transactions. Housing developer Inland Homes (INL) ended the year strongly, selling two sites for a total of £12.7m. Inland Partnerships, which develops social housing, has entered into a £29.5m contract to develop 136 homes. Kestrel Partners has taken a 4.32% stake in telematics equipment and services provider Trakm8 (TRAK). Gear4Music (G4M) says that Christmas sales grew by 42%. The online musical instruments retailer is still on course for a full year profit of £2.4m. Peter Scott is taking on the role of chief executive at digital marketing services provider Be Heard Group (BHRD) and David Morrison will replace him as chairman. Smart metering technology supplier CyanConnode (CYAN) says that its order book is in excess of $100m even though a large order has been delayed. There was £5.5m in the bank at the end of 2017. Cambria Automobiles (CAMB) has announced a new Lamborghini dealership in Chelmsford on the same site as the Bentley dealership. The showroom should be open by the end of the first quarter. A new site in Hatfield to house the new McLaren dealership and the company’s other dealerships in the area should be completed by the end of the year. Cambria is still cautious about the UK car market. Trading in the first quarter is in line with expectations. Chairman Philip Swatman and his wife sold 100,000 shares at 57p a share, leaving them with 200,000 shares. Marble quarry operator Fox Marble Holdings (FOX) is raising £2.76m through a placing at 10.5p a share and Indian firm Kesari Tours PVT is investing £2m of the cash. Kesari boss Shailesh Patil has committed to buying a minimum of 3,000 tonnes a year of marble in return for exclusivity in the Arabian Gulf. Fox is also raising £235,000 via a convertible loan note issue and capitalising £783,000 of debt. Directors are also taking part of their pay in the form of shares. Fox will use £1.5m of the cash to repay debt and the rest will go towards expanding production. Total marble production was 8,800 tonnes in 2017. The new processing facility has capacity of up to 440,000 square metres a year so it will be able to cope with much higher quarry production. Network data processing technology supplier Ethernet Networks Ltd (ENET) has disappointed the market six months after flotation. A customer has chosen to sign up to a different proposal than expected and two other projects have been delayed until 2018. This means that 2017 revenues and profit will be lower than anticipated, although profit will be higher than 2016. In 2016, revenues were $2.16m and operating profit was $339,000, which was exceeded in the first half of 2017 even though revenues were much lower. Victoria Oil and Gas (VOG) says that its gas supply contract with ENEO in Cameroon has not been extended. This had covered 53% of Logbaba gas sales revenues in 2017. ENEO owes $8.7m. Churchill China (CHH) says that its 2017 results will be slightly better than expected thanks to strong export sales. Full year figures will be published on 27 March. Strand Hanson has resigned as nominated adviser to BNN Technology (BNN) following news that the company failed to account for a bonus claimed by Darren Mercer. The £270,000 bonus has been offset against the £450,000 he owes the company. Mercer also claims that the remaining amount of the loan should be reduced. Corero Network Services (CNS) has gained $400,000 of contracts for its SmartWall cyber security system. Ultrasound simulation technology provider Medaphor Group (MED) says that 2017 revenues were 27% ahead at £4.2m. The loss will be £2.9m. There was £4.2m in the bank at the end of 2017. Cantor Fitzgerald has downgraded its 2017 profit forecast for waste treatment and energy generation plants developer Green and Smart Holdings (GSH) from RM7m to RM6.7m and the 2018 figure from RM16.9m to RM10.8m because of delays to electricity generation projects. Local project finance is taking longer than expected to secure. Attractions designer Paragon Entertainment Ltd (PEL) chief executive John Dobson has acquired 1.43 million shares at 2.5p each. That increases his stake to 6.55%. This has helped the share price to recover after almost a year of decline following disappointing trading statement. Babestation producer Cellcast (CLTV) says that it intends to provide for the £495,000 it had invested in the Lexinta fund, which is being investigated by the Swiss authorities. The investment vale had been raised to £754,000 in the last accounts. This appears to be in the trade receivables in the balance sheet last June. There was £862,000 in cash in the bank. European PR firm SEC (SECG) has acquired 51% of Colombia-based Newlink for up to €2.2m and this could rise to €4.3m if the option to acquire the rest of the shares is taken up in the next five years. TyraTech Inc (TYR) will buy back $8.4m worth of shares at the tender price of 3p a share. Oil and gas firm San Leon Energy (SLE) has ended bid discussions with two potential bidders. A potential reverse takeover is still on the cards. Even though Crawshaw Group (CRAW) says that the performance of its factory shops has been good, like-for-like sales for the delicatessen products retailer have declined. This has led Peel Hunt to increase its loss forecasts for this year and next year as like-for-like revenues are expected to continue to decline. Egdon Resources (EDR) has had its appeal for planning permission for the Wressle oil development in Lincolnshire. Egdon owns 25% and Union Jack Oil (UJO) has a 15% stake. Egdon has been allow to retain the original planning permission until the end of April. ReNeuron (RENE) is consolidating 100 shares into one new share. Management hopes that this will help to attract institutional investors. The cell-based therapeutics developer had £45.3m in the bank at the end of September 2017. Christopher Brown is stepping down as chief executive of TomCo Energy (TOM) but he will remain for the short-term. He has agreed to loan £100,000 to the company. Packaging machinery manufacturer Molins (MLIN) is changing its name to Mpac following the sale of the Molins tobacco machinery business. The People’s Operator (TPOP) has returned from suspension having completed its £2.82m fundraising at 0.1p a share. The London Stock Exchange says that the settlement of outstanding trades is occurring and it allowed the restoration in dealings, but it says that it will continue to closely monitor the situation. BOS Global Holdings (BOS) has appointed Marcus Yeoman, Will Giles and Michael Wilczynski to the board andMark Uren has resigned, which means that it does have the minimum required number of three directors. The finances of the software developer remain uncertain and trading in the shares is still suspended. A general meeting requisition has been withdrawn. Average oil production from the Trinidad operations of Range Resources Ltd (RRL) in the fourth quarter of 2017 was 629 barrels a day and the current daily production is 703 barrels a day. Premier African Minerals (PREM) did not meet its guidance on production at the RHA tungsten mine in the last quarter of 2017 and this means that it did not achieve profitable production in December. Premier has said that it would not provide any more cash unless profitability were achieved. Premier is spinning off the Zulu lithium project, which could have a value greater than Premier, and drilling programmes could be funded by offering a stake in the new company. 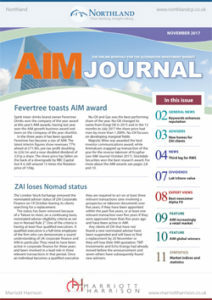 Cayman Islands-based cash shell AIQ Ltd (AIQ) (ww.aiqhub.com) is joining the standard list on 9 January. AIQ has raised £3.6m after expenses, mainly at 8p a share. The plan is to seek an e-commerce acquisition, which has a strong management and is near to cash generation. North American oil and gas explorer and producer PennPetro Energy (PPP) acquired Nobel Petroleum UK last May, which gives it a 75% working interest in City of Gonzales petroleum leases in Texas. Nobel has secured £2m in additional funding for the leases. PennPetro joined the standard list and was valued at £17.7m at 25p a share. Former Arsenal managing director Keith Edelman is chairman.